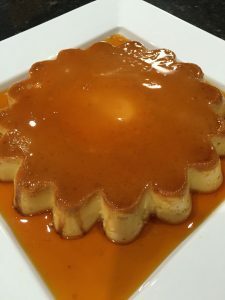 This is my grandmother’s original Flan recipe. Best made the day before serving, which makes for easy entertaining. This recipe yields one small flan in one of my Silicone Baking Molds, which is about 9″ round pan. You can use non-silicone pan. Make Caramel: Heat Sugar in sauce pan and heat until it makes caramel golden-brown. Make sure to move the pan around as it will burn easily – do not stir. Pour caramel in the mold and coat bottom and all sides. Set aside on rimmed baking sheet. Make Custard: Add eggs, condensed and evaporated milk, vanilla and salt into a large mixing bowl, and mix gently using a whisk until mixture comes together. Pour mixture into the cake or silicone mold through a fine-mesh strainer (very important to remove egg yolk pieces). Cover baking mold with foil, and then carefully add a couple of inches of water to the baking pan. Reason is because you are baking this in “Baño Maria”. Bake, covered, for about 40 minutes or until set in the middle. Remove from oven and let come to room temperature, then place in the refrigerator for at least 4 hours or best overnight. To serve, invert flan onto a large plate with a short rim.